Soviet Union was a major world power after its establishment in 1922 and became a superpower after World War 2 in 1945. After World War 2, Soviet Union established a communist bloc which remained in tussle against US led bloc. Both USA and USSR remained in the state of ‘cold war’ between 1945 and 1990 during which both superpowers escaped a full fledge war but oppose each other in various conflicts through their proxies. The whole era is especially known for the ‘Cold War’ between the two superpowers. This situation ended in 1992 with the collapse of USSR after which USA emerged as the sole superpower. The main reasons behind the collapse of USSR are following. After World War 2 in 1945, Soviet Union captured the whole of Eastern Europe including East Germany while its influence spread in several areas of Asia, Europe and South America. USA and its allies formed Western Bloc in order to counter this situation after which the ‘Cold War’ started between USSR, USA and their allies. Korean War (1950-53), Cuban Crisis (1963), Vietnam War (1960s) and Soviet Invasion of Afghanistan (1979-88) were major confrontations between the two blocs while USA and USSR assisted their proxies in several other regional conflicts also. This continuous warfare put a burden on the economy of USSR and it weakened continuously with passage of time. This proved to be an important reason for the collapse of USSR. In December 1979, USSR invaded Afghanistan in order to protect its proxy regime of Afghanistan against any Afghan resistance. 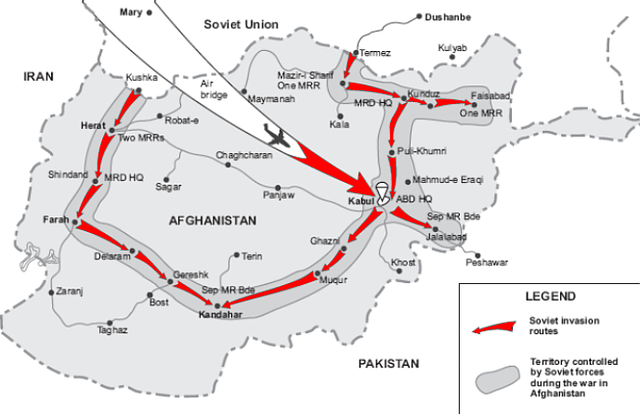 Russian invasion put alarms in neighboring countries of Afghanistan especially Pakistan where this invasion and capture by USSR was seen as a part of plan to reach the warm waters (Arabian Sea). Pakistan supported the resistance movement of Afghans against the Soviet invasion from its start and it was later joined by USA and several other Muslim and European countries. The war was fought with religious fervor also against the ‘Atheist invaders’ (USSR). Soviet forces and their Afghan supporters failed to suppress the guerilla warfare of Afghan opponents who were continuously supported by rich and advanced Western and Muslim countries, militarily and economically. This failed invasion by USSR not only drained the economy of Soviet Union but it also ended the title of the Soviet Army as ‘undefeatable’ which resulted in collapse of Soviet Union and independence of many countries. Soviet Union was a one-party government in which there was no place for opposition of Communist regime while persecution of opponents was not unusual. During Russian Civil War (1918-22), thousands of peasants and industrial workers were executed by Russian secret police. Gulags (labor camps) were established during Russian Civil War and they retained their position till 1950s. Millions of people were thrown in these camps for forced labor that resulted in deaths of many. But the most horrific period came during the era of Joseph Stalin. He suppressed anyone considered to be against communism of his choice through his intelligence agencies and secret police. He assassinated his rivals in communist party like Leon Trotsky (founder of red Army), Nikolai Yezhov (head of Soviet secret agency NKVD) and several others during Great Purge (1936-38) in order to ‘cleanse’ the communist party and red army from undesired persons. Gulags also expanded during his era. On number of occasions, whole population of different areas was transferred to other destinations by Soviets. This forced displacement took lives of large number of peoples and change the ethnic composition of several areas. These oppressive measures consolidated the communist rule in occupied areas. But people in these areas never accepted the oppressive regime by heart and when they were given chance to make choice about their destiny (in the start of 1990s), people of these areas immediately voted in favor of freedom from USSR. USSR was an atheist regime where communist party had the complete control over the government and one had to be an atheist to be a part of communist party. But it didn’t end there as religions and religious people remained under persecution of the Soviet regime. 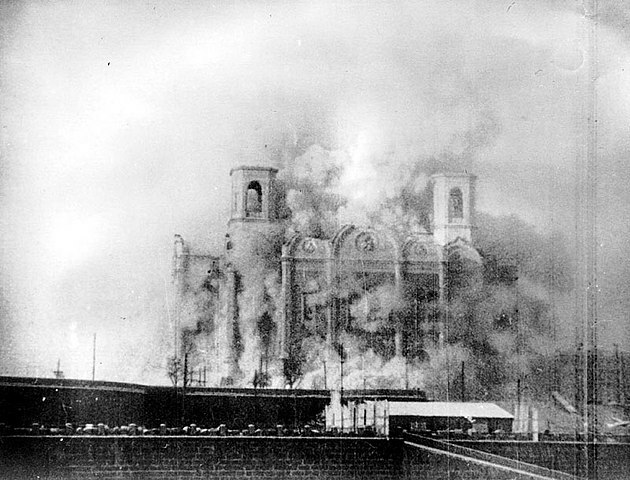 Christians and Muslims faced the worst persecution under Soviet Union during various eras. Christianity (Russian Orthodox) lost its status of official religion in USSR that it was enjoying during Russian Empire. Soviet authorities locked and demolished several Churches and Mosques during the whole Soviet era and there were restrictions on religious practices. Several priests and clergymen were executed during the starting era of Soviet Revolution. In 1917, there were around 25000 mosques in Central Asia that were reduced to just 500 in the 1970s. Due to this brutal treatment of religions, the Christians and Muslims of several republics in USSR favored the independence of their sates from Soviet Union in the start of 1990s. This situation was also used in Afghan War that was also fought on religious grounds against the atheist Soviet Union. Soviet Union was hit by several famines due to wars and its economic policies. The first famine was the famine of 1921-23 that took lives of around 5 million people in the regions of Volga and Ural rivers. This famine was the direct effect of Russian Civil War and Soviet policy of ‘confiscation of grain’. The collectivization of agriculture sector was adopted by Stalin that resulted in the most sever famine of 1932-33 that resulted in the deaths of around 6 million people, mostly in Ukraine and North Caucasus. The third major famine occurred in 1946-47 that took the lives of more than 1 million people. Soviet economic policies and World War 2 were major causes of this famine. These famines proved that not only the economic policies of USSR were unrealistic but also the authorities were more interested in concealing the number of deaths instead of providing food to the affected people. Non Russian people were the main targets of these famines and it created such hatred against communism and USSR in their hearts that they were ready to accept any chance provided for their freedom from USSR.